Hilaire-Germain-Edgar Degas [1834-1917], the artist; (Degas sale, Galerie Georges Petit, Paris, 6-8 May 1918, no. 96); purchased by (Paul Rosenberg et Cie, Paris); sold by 1931 through (Goupil & Cie, London) to Herbert C. Coleman, London and Manchester, England; (Paul Rosenberg et Cie., Paris); sold March 1938 to Chester Dale, New York; gift 1963 to NGA. 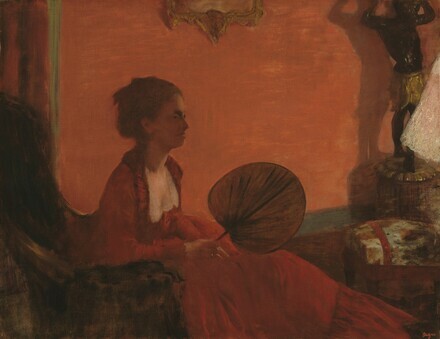 According to a letter dated 13 April 1938 from Paul Rosenberg to Chester Dale, in NGA curatorial files, Rosenberg purchased the painting from the Degas sale, and sold it to Coleman, a Manchester cotton dealer, through the Goupil Gallery in London; when Coleman retired, he resold the painting to Rosenberg who sold it to Dale after a few years. Salon of 1870, Paris, no. 758 as Portrait de Mme C.
Probably Le 2e Exposition de Peinture [Second Impressionist Exhibition], Paris, 1876, no. 43 as Portrait, le soir. From Impressionism to Modernism: The Chester Dale Collection, National Gallery of Art, Washington, January 2010-January 2012, unnumbered catalogue, repro. French Paintings from the Chester Dale Collection. National Gallery of Art, Washington, 1942: 36, repro. French Paintings from the Chester Dale Collection. National Gallery of Art, Washington, 1944: 36, repro. Lemoisne, Paul André. Degas et son oeuvre. 4 vols. Paris, 1946-1949. French Paintings from the Chester Dale Collection. National Gallery of Art, Washington, 1953: 46, repro. Walker, John. National Gallery of Art, Washington, D.C. New York, 1963 (reprinted 1964 in French, German, and Spanish): 326, repro. Eighteenth and Nineteenth Century Paintings & Sculpture of the French School in the Chester Dale Collection, National Gallery of Art, Washington, 1965: 75, repro. Summary Catalogue of European Paintings and Sculpture. National Gallery of Art, Washington, 1965: 39. European Paintings and Sculpture, Illustrations. National Gallery of Art, Washington, 1968: 32, repro. European Paintings: An Illustrated Summary Catalogue. National Gallery of Art, Washington, 1975: 98, repro. Walker, John. National Gallery of Art, Washington. Rev. ed. New York, 1984: 474, no. 701, color repro. European Paintings: An Illustrated Catalogue. National Gallery of Art, Washington, 1985: 120, repro. Bernard, Bruce. The Impressionist Revolution. London, 1986:81, repro. Gingold, Diane J., and Elizabeth A.C. Weil. The Corporate Patron. New York, 1991: 32, color repro. Bailey, Colin B. Renoir's Portraits: Impressions of an age.Yale University Press New Haven and London, in association with National Gallery of Canada Ottawa, 1997,no. 64,repro. Kelder, Diane. The Great Book of French Impressionism, 1997, no. 267, repro.